Metroid is a classic game that Nintendo originally released for the Nintendo Entertainment System in 1986. This was probably the first high profile game to feature a female hero. This game has also been re-released on the GameBoy Advance twice, once in the NES Classic series, and another time as an unlockable game once Metroid: Zero Mission is beaten. It is also unlockable when you beat Metroid Prime on the Game Cube and Metroid Fusion is connected via the GameBoy Advance link cable. The reviewed version was the unlocked Metroid: Zero Mission version, but that shouldn\'t make any difference as all versions are basically identical, except that all versions except the NES one (I assume the GBA Classic one does as well) store the last password used so you don\'t have to type it in when you continue. This is a 2D platform game where you run, jump, shoot, and otherwise explore a rather dark planet completely inhabited by evil aliens. There are several weapons and attacks, as well as other moves that help keep things interesting. This was one of the first games that allowed a nearly non-linear exploration of a world. Once you grab certain power-ups, you can go to all kinds of new places, and you don\'t necessarily have to find them all; just the ones needed to move on. Of course, you may want to find them all..
What kind of things can you find in this game? 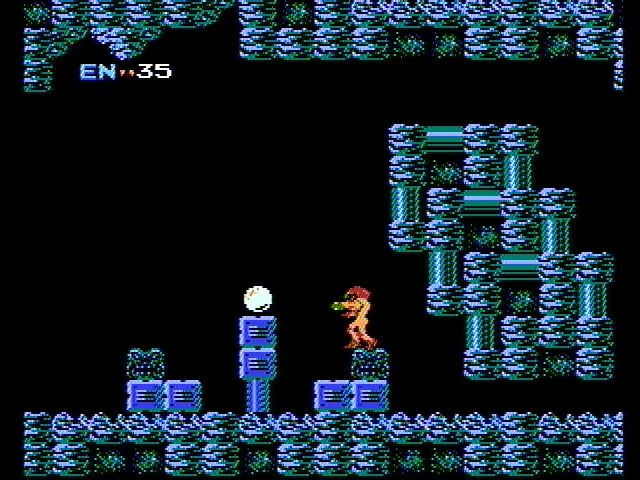 This game started the whole series, and as such, includes many items and weapons that all (or almost all) other Metroid games have kept in their arsenals as well. The power-ups include: 1) Short Beam (starting weapon) 2) Morph Ball - can turn into a ball and roll around 3) Missiles - powerful attacks with limited ammo that you collect more of throughout 4) Long Beam - fires a straight shot that keeps going until the edge of the screen 5) Energy Tank - increases your maximum energy by 100 up to a max of 699 6) Morph Ball Bomb - can place a time-delayed bomb when in Morph Ball mode 7) Ice Beam - a useful shot that can freeze enemies in place 8) High Jump - allows you to jump 50% higher 9) Wave Beam - a powerful wavy shot that travels through walls (cannot be combined with Ice Beam!) 10) Screw Attack - The Mighty Screw Attack which kills all normal enemies by spin-jumping into them! How about the graphics and sound? The graphics are what you would expect from a first generation NES game; they fit the bill but nothing special. They hold up ok; this game isn\'t about flashy graphics, it\'s about a great action-adventure. I think the small GBA screen does this game well. The sound is also typical first generation Nintendo; many simple melodies that end up sticking in your head, and somehow fit and are emulated in many sequals to come. It\'s not a classic my mere chance. No complaints here! This game does not have too much to complain about. There is violence, but killing evil aliens is not too much of a problem in our view. The only thing is what a friend of mine calls \'fan waving\' - as is a tradition with this series (which this game started), if you beat it in a certain time you can see Samus in a swimsuit in the ending, which allows you to play through the game again if you wish without a suit on. Other than this concern, it\'s mostly harmless. This is a classic game that has held up well to the test of time and has spawned many other games in the series. I recommend this game to anyone who either has never played the original to completion but is otherwise a fan of the series, or just wants to see what it\'s all about. I recommend getting Metroid: Zero Mission for GameBoy Advance, or Metroid Prime for Game Cube, as the game is thrown in as an unlockable and you don\'t have to pay just for a nearly 20 year old game, like with the NES Classic version for GameBoy Advance. Anyone looking for a really good classic platform game will no doubt enjoy it. However, be warned - it\'s easily one of the most challenging of all of the Metroid games. If you do not enjoy that kind of challenge, then perhaps playing a classic such as this is not worth it for you. Otherwise, enjoy an old, but great game!